Prehung hinged vs pocket door – comparison chart. Do not hide in the wall. Hinges and hardware more visible. Heat appearance with minimum hardware visibility. Pocket door 100% hidden in the wall while fully opened. No restrictions to installation. One of the most common interior doors type. Required additional space inside the wall free of any water or drain pipes as well as electrical wiring. Best suits for smaller rooms. From 18” to 36” wide with 2” increment. Normally 6”-8” high. From 2’ to 3’ wide with 2” increment. Typically 80” high. Depends on material, quality and size, but on average it is cheaper than a pocket door. Greatly vary, but a pocket door frame, mounting hardware, door slab, and wood boards for finishing the door normally more expensive compare to purchasing the prehung wood door with frame. Charges to install prehung doors are significantly lower compare to installation of pocket doors. Labor fees for pocket door installation are higher in comparison with prehung hinged door installation. Installation of the prehung hinged door is relatively an easy task. Installation of a single 32” x 80” pruhung door into ready opening normally is less than one hour task for an experienced carpenter. Installation and finishing the pocket door might take a few hours to complete. Easy to repair or replace with the same size door without damaging interior walls. Replacement of the pocket door could be extremely time consuming and complex process in case the door frame has to be removed. Depends, but typically the prehung hinged door could be easily customized for security or sound insulation purpose. Not designed as a sound proof type of a door and have very low ability to secure. 1 Rating was estimated on the scale from 1 to 5, accounting 1 as lowest and 5 as the highest quality of a product. Always consider the fact: not all products made equally the same, and performance of a particular door significantly depends on individual product quality, adequate installation, and proper maintenance. 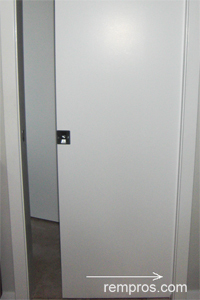 Hinged doors are way more popular because flexibility in installation and easiness of replacement. 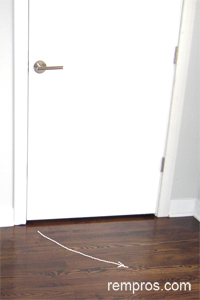 Buta pocked door is a great solution for tight places where it might be hard to open hinged door with 32” or 36” swing.